I went to see neighbor’s brand new baby. As Steve and I sat on the couch with the newborn, the other three kids were wild and energetic. Obviously, there were a lot of changes in their house and they were each coping with the changes in their own way. I could see the mother was tired from the newborn and probably even more so from the others that also required so much attention. The new mom then made an observation, “People say to soak this up because one day I’m going to miss it. I can’t even have two seconds to myself, I can’t imagine missing it. Your kids are starting to get a little older, do you miss this?” I looked around at her kids jumping off the furniture, one throwing a soft toy around the house and the tissue paper from our gift littering the floor. I couldn’t lie. I did not miss those moments. The moments where I was so tired I could cry at any moment. Yes, you might miss the newborn snuggles. But newborns are really like puppies and they grow up way too quick and then the newborn snuggles are gone and you’re left with a cranky teething baby. We commiserated. And then joked that the women who keep telling us that we’ll miss this stage are never the ones willing to take your kids for the afternoon to give you a break so you can think about missing this stage! I felt for that new mom (and made note as to how I could help without telling her to soak this in because she’s going to miss it – because that is really not helpful at all). 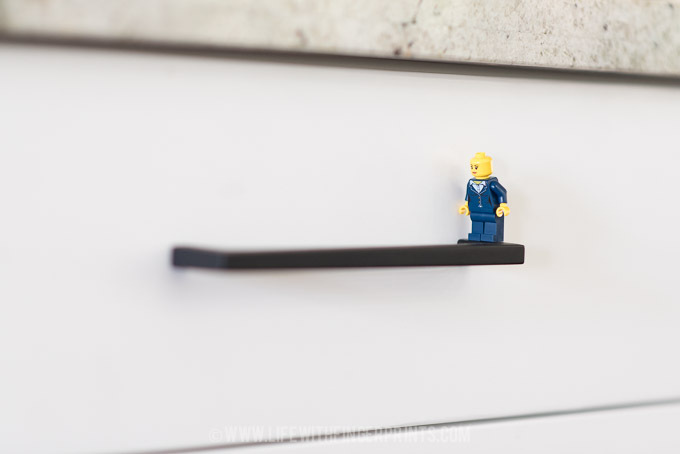 And then I came home and found this little Lego guy on the handle of my cabinet. I’m not sure how long it had been there but he caught my eye and I had the realization that it’s these little things I suppose I’ll miss. Not the fighting. Or the whining. Or the up-all-night children. But the little quiet moments that remind me that there’s a little human in the house that leaves unexpected toys in places where I find them. It’s walking upstairs and seeing books lined up in a row making the perfect car path. It’s hard to even recognize these little moments as something to remember when there’s so much going on so I’m grateful when they catch me by surprise and it sinks in just for a second. It may not be a glamorous job – but it’s definitely important. Thank you for this—it actually made me cry. Haha! Baby #5 (and last!) at my house is 6 months old and she is hard. I am so tired and so glad that time moves forward. It’s good to hear a similar opinion and be reminded that it’s ok to feel like I’m not going to miss this stage.